In the previous article I explained how creating a Facebook fan page for your game will help you to get new members. This article will show you how to create a page for your roleplaying game, if you already have a fan page and want to know how to set it to automatically publish a link to your game’s latest post, read this article. To get started, go to facebook.com/pages and click “create page”. You’re creating a page that you want to use to post regular information about your game, so you’ll want to create an “Official Page” not a “Community Page”. The latter doesn’t give us the amount of control and customisation we want. You then have to choose what you are creating this page for. It’s most likely that your game doesn’t fit the other two options, so choose “Brand, product or Organisation”, and from the dropdown you most likely need to choose “Game”. Enter a name for your page. This is the name that will appear in big letters at the top of the page so make sure it accurately describes your game. You might also want to add “RPG” or “RP game” on the end to let people know instantly that this is a roleplaying game. 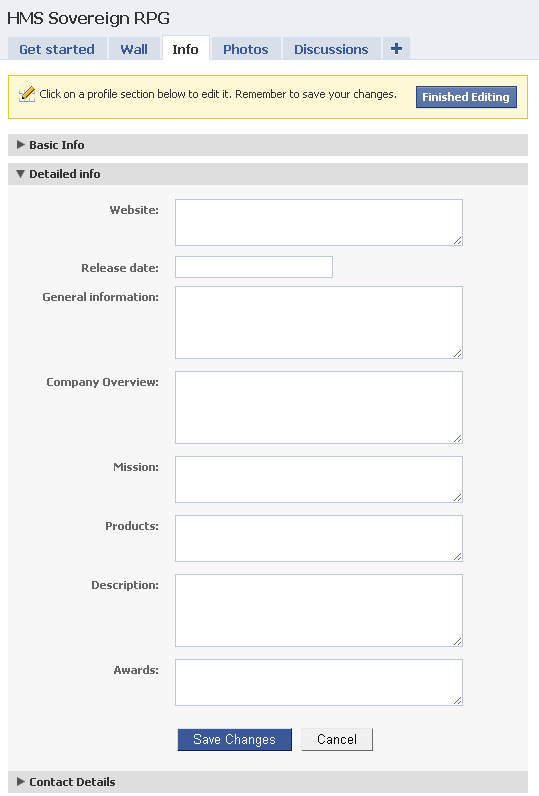 There are several numbered steps to complete to customise your page. You’ll notice that Facebook wants us to invite some people to join the page, first we need to customise it a bit so that there’s something to see. Add an image by uploading it from your computer. This will show in the top left of your Facebook page, make sure this image is relevant to your game as it will catch the eye of anyone visiting the page immediately. One of the goals for your page will be to attract people to “Like” the page, this allows you to update them about your game. Be the first fan of the page by clicking “Like” at the top. On the left of your page there’s a small box which you can edit. This is an ideal place to put a short piece of information about your game so that new members can very quickly read what your game is about. You can’t put much information in here, so you’ll have to keep it brief. If you click on the “info” tab you’ll be able to add some more information about your game into the fields provided. If you’ve already filled in the quick text box (above) you’ll see this information repeated in one of the boxes here. Click “Detailed Info” to expand another set of textboxes. Not all of these fields will be applicable to your game, so you might want to ignore some of them. If your game posts exist on a separate website, like OngoingWorlds then make sure you put the URL into the “Website” box so that people can follow the link and read your most recent posts. Facebook allows you to create albums of photos. If you have any images that you think might be interesting to new members of your game (fan art etc) add them here. Facebook automatically creates the tabs Wall, Info, Photos and Discussions. Discussions adds some functionality like a forum, but messages posted here have the tendency to be missed, so I’d recommend you delete it unless you’re going to use it. Click the edit icon on the tab, and select ‘Delete’. Invite all the friends who you think will be interested in your game, they’ll be sent a message with a link to your page. They can choose to view the page, and to “Like” it. If they do this, they’ll be kept up to date with all the status updates you put on the page’s wall. When selecting friends to suggest this page to, you might want to add a personal message, so that you can describe what the page is (keep it short! ), and why they’ll be interested in. Remember that your existing members will know what the page is about, but if you’re suggesting this to friends who haven’t ever taken part in a roleplaying game before you might have to explain exactly what it’s about. If you don’t want to share the burden of updating this page, you can set one of your Facebook friends to become an admin of the page too. You can do this by clicking “Edit page”, then “Manage Admins”. Over time you can post status updates to the page’s wall, this will show up in other member’s news feed, so you can use this to keep them informed about what’s happening in your game, and to encourage them to interact and comment on your post. You might also want to create a post in your Facebook page whenever someone posts in your game. There’s a way to do this automatically whenever someone posts in OngoingWorlds, if you want to know how to do that have a look at this article. Your Facebook page can be used to advertise your game, I’ve written an article about how I’ve been using the Facebook page to advertise the OngoingWorlds website. Good Video Games for RPGs – S.T.A.L.K.E.R.